Lucille Ball's favorite writer, aside from the wonderful writers of her show, was John Barbour. She said for the ten years that John was the film critic for Los Angeles Magazine, she couldn't wait for the beginning of the month just to read his reviews. And watch him on KNBC's six o'clock news! 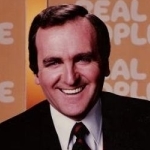 John changed the face of American TV as the Creator, Co-Host, Producer, and principal writer of 'Real People,' the country's first trend-setting reality show! When John was crafting the number one show in TV for three years, his commitment was always to STORY and PURPOSE! John's story... and what an amazing real story it is http://johnbarboursworld.com/about.html cannot be done justice in a few words, so go explore it, and know that after John's documentary about John Kennedy's assassination, 'The Garrison Tapes' won the '93 San Sebastian film festival Award, then John decided to retire. It had taken him over twenty years to tell Jim's story, and even though it was and still is ignored by nearly all media in America, John felt that at least it was finally out there. It was the most important story he could ever tell; and so why try to tell any others.